In 1940, Vivien Leigh and Laurence Olivier were at the height of their celebrity and also at the height of their love for each other. Leigh and Olivier started seeing each other while they both were married a couple of years prior, but by 1940 they were married and living as the quintessential British couple. But outside of the swirl of celebrity, something much larger was looming in the air for British people: war. Several high-powered officials (including Churchill) had turned against Hitler’s aggressive nature and decided that outright aggression was their only choice. In order to convince the public that war is honorable and justified, Churchill recruited Alexander Korda, Leigh and Olivier to make a propaganda film cleverly disguised as a historical romance story. That Hamilton Woman was the result of this collaboration. Leigh plays Emma, a down on her luck vagrant at the beginning of the movie. After she gets into a little scuffle, she lands herself in jail next to a prostitute. Emma decides to tell this willing prostitute her life story. She begins some years before when she was young and beautiful. She rises up from her cabaret routine to become engaged to a high-profile gentleman in London. But this gentleman has a lot of debts so he sells her to a relation of his in exchange for the wiping out of all of his debt. However she does not know what he did to her, so she thinks that the visit to Lord Hamilton is just an introduction into proper society for herself. Once she gets to Naples where Lord Hamilton is an ambassador, she realizes that he surrounds himself with pretty things including herself. She resigns to her fate, marries Lord Hamilton and settles into a life full of high society activities. This is interrupted by Lord Nelson (Olivier), a British naval captain, who bursts into their estate asking for assistance from Naples for his fight against Napoleon. They fall in love at first sight, but they take a while to truly understand their feelings. Lady Hamilton woos the Queen of Naples into giving Lord Nelson troops and they win the battle. As time progresses Lord Nelson and Lady Hamilton keep crossing paths until one night when they declare their love for each other. But both of them are married and neither one of their spouses would be willing to give them up. They defy these restrictions and carry on their affair in public which gets Lord Nelson in some trouble with his superiors. 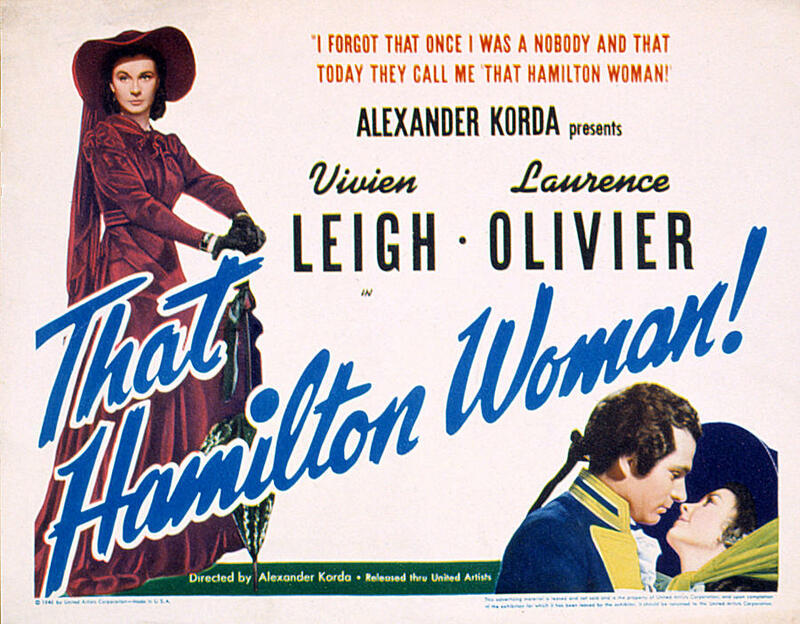 He is sent back to London and Lady Hamilton follows him. After several sequences involving fights and tense discussions with Lord Nelson’s wife, they finally end up together, peacefully living in the country. But one day a man comes to their door and asks Lord Nelson to rejoin the army and defeat Napoleon one more time. He goes to his duty despite not having an arm or one of his eyes. Life does not end up well for him or their romance. As you can tell from my plot description, this movie is stuffed to the brim with plot. There are many twists and turns along this Napoleon highway. These events are made even heavier by the many grandstanding speeches made by Lord Nelson (and written by Churchill) that were supposed to allude to the duty Englishmen have towards their country even during modern times. Not even Leigh and Olivier (two of the best actors of their generation) could save scenes from being too weighed down by boring exposition. But man do they try. Leigh is ravishing as Emma even when she is a vagrant. My eyes followed her around the room to the exclusion of everything else including important plot points. Olivier plays his character close to his chest, never really bursting fourth with emotion unless he is helping to take down a ship. However there is no doubt that Nelson loved Emma, he just did in his own quiet way. This movie has its moments, but for me they didn’t always add up to having good time. The attraction between Leigh and Olivier is what holds the movie together which is just a limp propaganda film.